Taught by Irena Yamboliev, a lecturer in the English department and Program in Writing and Rhetoric (PWR), ENGLISH 127 will lead students through the works of authors such as Charlotte Bronte, Charles Dickens, Jeffrey Eugenides and Junot Diaz. As a specialist in the 19th-century Victorian novel, Yamboliev was inspired to create the class after pondering how the Victorian genre has created new growth in contemporary novels as people moved across the Atlantic. She cited the role of family in one’s life as a major literary theme. Students will engage in close reading with works of literature, absorbing both a history of literary tradition and ideas about universal personal growth, according to Yamboliev. In Eugenides’ contemporary novel “Middlesex,” for example, Cal Stephanides experiences a journey across genders to find identity. Meanwhile, William Crimsworth, in Bronte’s “The Professor,” struggles to balance vocation and romance. The class will incorporate American novels beyond “Middlesex” as well. Students will observe how characters grapple with not only personal changes but also environmental changes and interactions with diversity. According to Yamboliev, works featured in the course highlight the experience of growing up as an immigrant. “I’m in the process of becoming adult, and I want to see how I can become better at it,” said Arianna Lombard ’18, an English major in the class, who is also a Daily staffer. 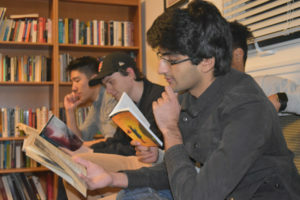 With a combination of online discussion, critical literary analysis and presentations, students will drive the discussion-based seminars using textual evidence, Yamboliev said, adding that students will draw interpretations on small-scale author choices to answer big questions on “Bildungsromans,” or stories of growing up. In the long run, Yamboliev hopes students will be able to answer these questions about their own stories. By reading how authors use language microscopically, students may discover a narrating voice for themselves, she said. “These novels might be removed from us, chronologically, but are still alive … and able to inform the way we tell stories of growing up now,” Yamboliev said.